All this week, The Takeout staff writer Kate Bernot is attempting to turn her favorite dishes into soup. For those of you just tuning in, my name is Kate Bernot and I might like soup too much. To my surprise, not everyone wants to eat it five nights a week loves it as much as I do. That’s why I’ve embarked on a journey to soup-ify some of my favorite foods, hoping it will get friends and loved ones on board with my winter fixation. For this go-round, I wanted to make a soup version of a universally beloved food: tacos. My boyfriend especially is a fan, and he’s pretty savvy with Southwestern and Mexican food in general, having grown up in Phoenix and lived in New Mexico for a while. So I figured a hearty, beefy taco soup would be right up his (and my) alley. 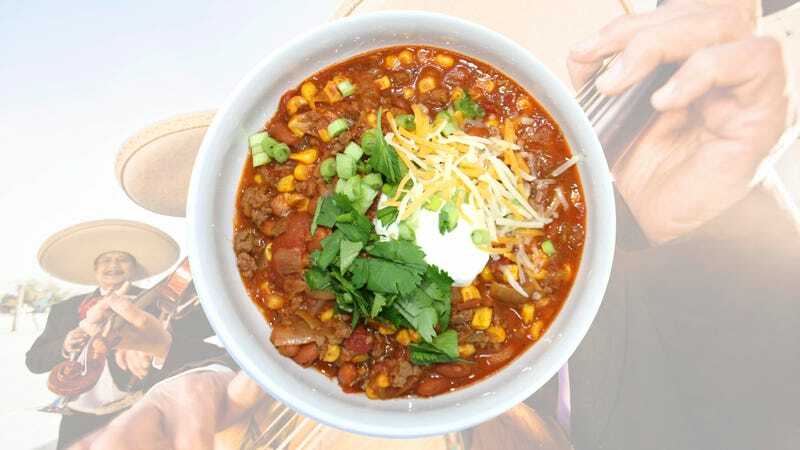 In my taco soup recipe search, of course I came across numerous blogs claiming to have the superlative recipe. But how could I trust a random Pinterest-linking recipe with a measly two reviews? No, I needed one that was tried and tested. In a Dutch oven or large pot, brown the ground beef with the onions until cooked through. Drain excess fat. Add the rest of the ingredients (not the garnishes) and simmer for an hour. OK, how easy is that? If you can operate a can opener, you can make this recipe. But while it scored points for cost-effectiveness and ease, the soup was an overall letdown. I’d been hyping up the soup around my house, talking about the five-star reviews and how novel taco soup would be. As I dumped the cans of beans and corn into the pot, my boyfriend looked over my shoulder: Isn’t this just chili? No, no, no, I protested. This uh, has ranch seasoning in it. Dammit, he was right. The fairly thick soup tastes like a lame chili (since it has no chili powder beyond whatever’s in the taco seasoning packet), or a cross between Hamburger Helper Stroganoff and an Old El Paso taco dinner kit. It wasn’t awful; I actually think kids might like it because the ranch and ground beef are familiar flavors. But there wasn’t much taco essence to it beyond the vaguely Southwest combo of beans and tomatoes and garnishes. Crushing up tortilla shells for the topping and using high-quality sour cream (shout out to Tillamook brand; I could eat that straight with a spoon) helped increase its taco-ness. But overall, it missed the mark and was overly salty. With all-canned ingredients, was I really shocked? I guess I might make this recipe again if I was trying to clean out my pantry or something. It’s certainly filling, and has a respectable balance of sweet-tangy tomato to rich beef and earthy beans. If you’re in the mood for the beef-tomato-beans-spice combo though, you’re really just better off making a killer chili recipe. Put taco soup in the loss column, and join me next time when I attempt baked potato soup. What&apos;s your favorite recipe that uses loads of butter? Why the hype over McDonald&apos;s Buttermilk Crispy Tenders?